Last month, I unexpectedly was able to visit the National Portrait Gallery and American Art Museum in Washington, D.C (both are located in the old U.S. Patent Building). It had been a while since I was able to visit and enjoyed having enough time to wander through the permanent collection and current exhibitions. One exhibition in particular stood out to me as I had never heard of the artist or seen one of his works before. 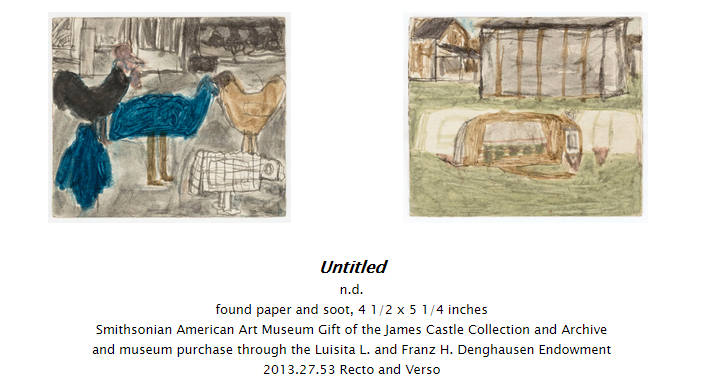 That exhibition was Untitled: The Art of James Castle. James Castle (1899 to 1977) spent nearly every day of his life creating artwork - for nearly seven decades. He was a self-taught artist who made his own ink from mixing wood stove soot and saliva. He sharpened sticks and other found objects to use as drawing utensils. 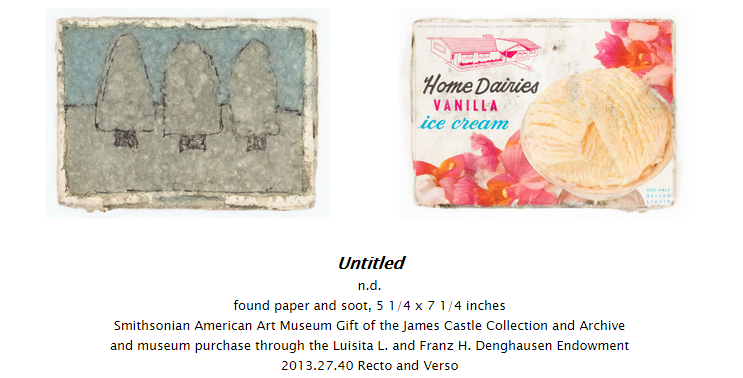 He would draw on anything - mostly ephemera: packaging, mail, advertisements, periodicals, food containers, etc. He also spent the majority of his life not realizing his drawings, sculptures, and handmade books were art. Castle, you see, was born deaf. Today, that would not be a limitation, but in 1899 it was a different story. Castle was the fifth of seven children. His mother, Mary Nora Scanlon, was a local midwife, his father, Frances J. Castle, the postmaster who ran the post office and general store out of their living room. Castle grew up in the small town of Garden Valley, Idaho and moved around to other areas of Idaho during his life. He did not attend school until 1910. He attended the Gooding School for Deaf and Blind for five years (until 1915). His education always comes up in conversation, because despite his use of the alphabet or the written language in his works, no one knows how well Castle could read or write. Regardless if he could read or write, he could definitely express himself and making art was a daily ritual for him. It is said that he would go through the trash, not just at home, but throughout the neighborhood to find his materials. At times, his family would purchase store-bought art materials, which he incorporated with his usual practices. He captured the world around him from exteriors to interiors, landscapes to people, animals to household objects, and on occasion an element of pop culture. It was not until the 1950s that Castle's work caught the attention of galleries and museums. At the time, his nephew, Bob Beach, was attending the Museum Art School in Portland, Oregon. During a break, he convinced his uncle and family members to allow him to take back some of Castle's work to show his professors. Castle never really labeled his drawings as "art." His nephew was sure that it was art and this act launched Castle into the Pacific Northwest art world. From the 1960s until his death in 1977, Castle was featured in many exhibitions throughout the region. Unfortunately, when he did pass away, the family felt overwhelmed by all the attention and interest and denied access to his work for twenty years. In 1998, Castle's work was included in the Outsider Art Fair in New York City. Interest from museums and galleries again followed with new exhibitions and even purchases of his work by major museums for their permanent collections. In 2008, the Philadelphia Museum of Art opened James Castle: A Retrospective. 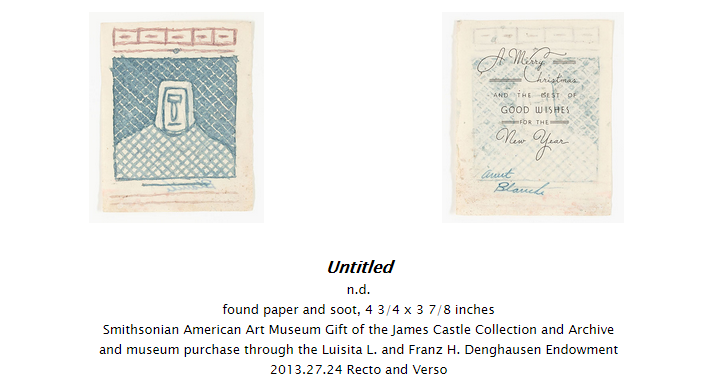 Then in 2013 the Venice Biennale included eleven works by Castle in the exhibition The Encyclopedic Palace. Also, in 2013 the Smithsonian American Art Museum acquired 54 pieces by James Castle (one of the largest public collections of his work to date). 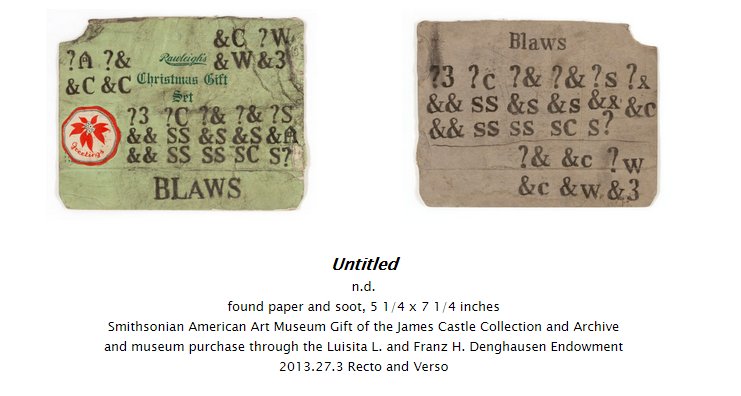 This, of course, lead to Nicholas R. Bell, the Fleur and Charles Bresler Senior Curator of American Craft and Decorative Art, organizing the current exhibition - Untitled: The Art of James Castle. The exhibition features this representative selection of the artist’s wonderful work: handmade books, drawings (including open back displays to show the material they were drawn on), and constructions (sculptures). I hope you will find time to check out the exhibition. It is located on the 2nd floor South, American Art Museum from September 26, 2014 – February 1, 2015. If you are unable to attend, there is a lovely catalogue for the exhibition, or you can visit the James Castle Collection and Archive online. Here are a few of my favorite pieces from the exhibition (due to the nature of is art, the pieces are all Untitled - hence the name of the exhibition in addition to not being dated). You can also see more pieces, plus enlarge the works below, at the exhibition's online gallery here.